Registration for this year’s Lowcountry Pie Getaway in beautiful Charleston, SC is officially open. We hope you will join us. This will be our fourth annual Getaway. In case you’re new to The Pie Academy and you’ve not seen the previous write ups, you can read about the last couple of them here and here. 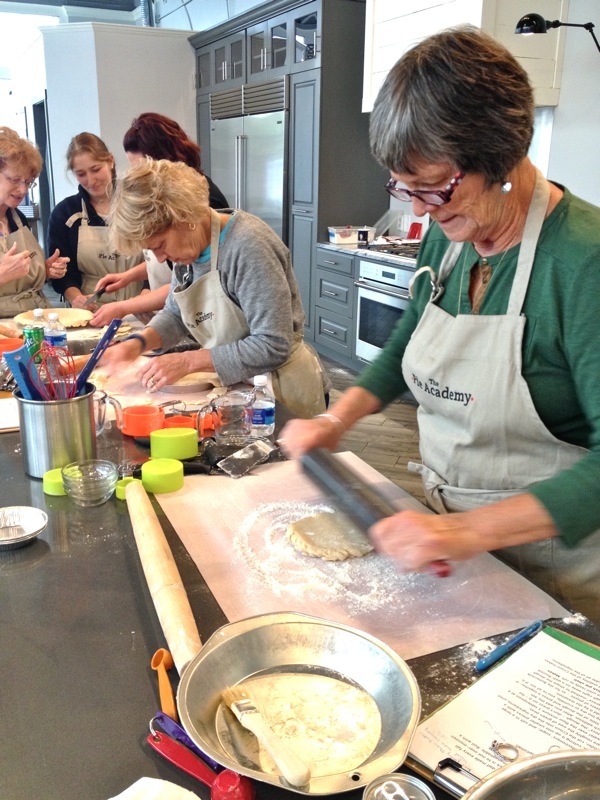 The Getaway is your chance to meet, mingle with and bake alongside other passionate pie makers from across the country. You’ll make plenty of new friends: our growing number of past attendees has taken on the feel of a big, extended family. Or you can bring one of your own. In years past we’ve had both spouses and best friends attend together. Ken putting the finishing touches on a galette. So it doesn’t matter if you’re a novice or pro – all are welcome. The instruction is personal and geared to your level. It’s hands-on, too. You’ll get some theory, but come prepared to roll up your sleeves, dive in, and bake. Your confidence and pie skills will take a giant leap forward. Gorgeous sites like this await the Charleston visitor. Once again we’ve chosen Charleston, South Carolina as our host city. It’s nearly impossible not to. Try as we might, we’ve not been able to find a more beautiful or unique location. 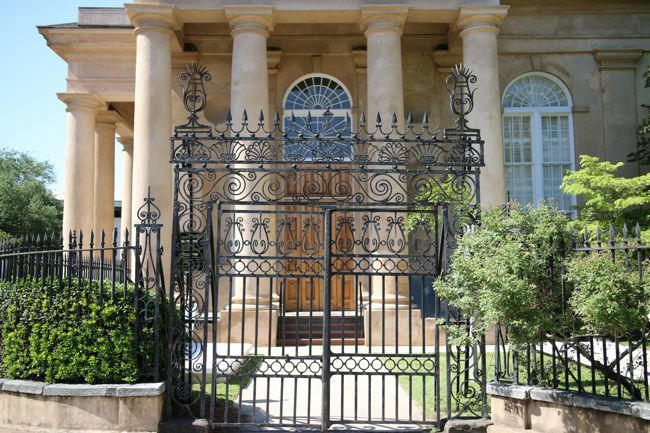 Historic and hospitable, Charleston has a magical quality. It casts a spell on visitors that they remember their entire lives. Everyone loves coming here, and nobody wants to leave. The other huge factor in our decision is the fabulous kitchen we have at our disposal for the weekend, a studio kitchen owned by our friend Chef Bob Waggoner. Chef Bob’s kitchen is centrally located – the tourists and horse drawn carriages stroll by all day long (we always wave obligingly) – and there’s ample work space for all of us. You’ll be mightily impressed with the facility. 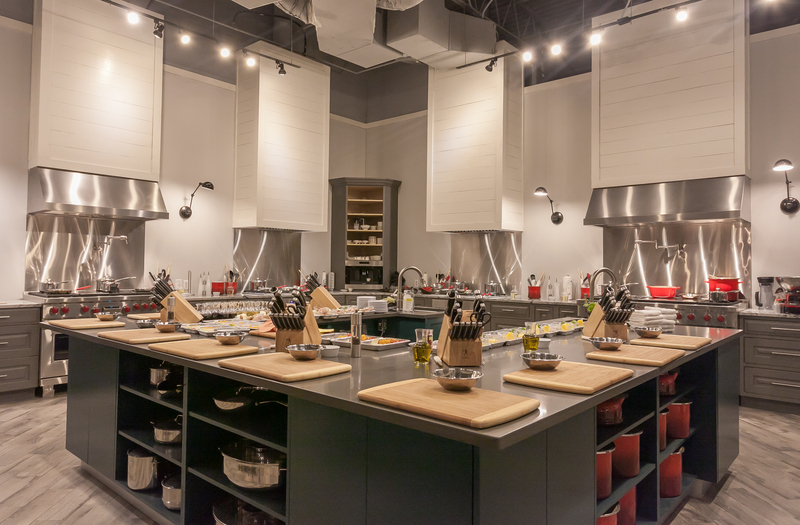 You’re going to flip for our host facility – Chef Bob Waggoner’s gorgeous studio kitchen. Because this is our fourth Getaway, we’ve had enough practice to work out the kinks, streamline the schedule, and figure out how to give you the best possible experience. So here, more or less, is what you can expect. Liz on a roll at our 2015 Lowcountry Pie Getaway. -Saturday morning. We’ll begin by immersing ourselves in pie crusts – talking about them, making them, and watching Ken demonstrate key techniques for preparing perfect pie pastry. 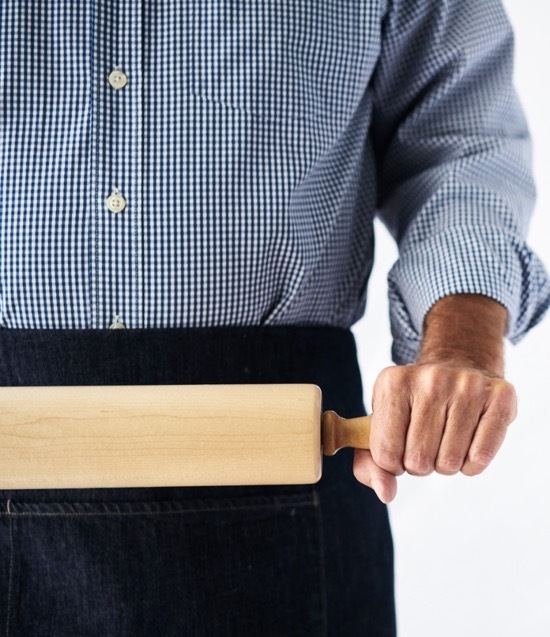 We’ll discuss the pros and cons of food processors and the KitchenAid mixer in the preparation of pie dough, and examine the critical components of making pie dough by hand. You’ll prepare several crusts of your own and by the time noon rolls around you’ll feel like a pie pastry dynamo. -Saturday lunch at our host facility. -Saturday dinner on your own. -Sunday morning. Today we celebrate and prepare dinner pies, not to mention some dessert pies, too. You’ll pick a baking partner and choose one of several savory pies from Ken’s Dinner Pies book or his new book, The Harvest Baker – galettes, hand pies, slab pies, and quiches among them. We’ll work up a good appetite, so when these pies come out of the oven, right before lunchtime, we’ll be ready to dig in! Sunday morning’s savory pie session is always one of the highlights of the Getaway. 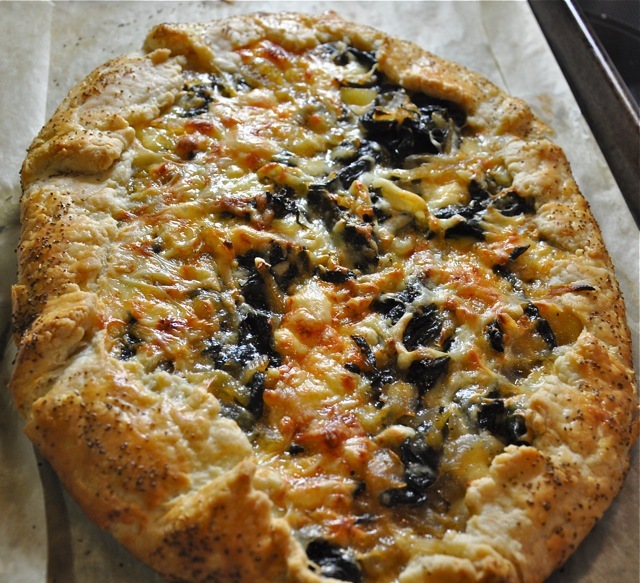 Savory pastries, like this Swiss chard galette, were one of the 2016 Getaway menu hits. -Sunday afternoon. We’ll cap off our Lowcountry Pie Getaway with a class on mini pies. Past years we’ve concentrated on fruit pies, but this year the focus will be on little pies that freeze well – pies you can thaw and serve for the holidays or give as gifts. These little minis – Lemon Chess, Millionaire Pies, Toll House and Pecan are some we might make – are the perfect size to pack in your luggage and take home to impress your friends. Our mini pie session will be followed by a Q&A wrap up. –Other Sunday mini sessions (as time permits): The Up- and Down-side of Whole Grain Pie Crusts; Using Precooked Fillings in Your Fruit Pies. Charleston offers a myriad of choices for lodging, from high end hotels to historic inns and Airbnb type rentals. (Bev and I had an Airbnb rental last year and we had a great experience.) Not everyone has the same taste or budget, so we like to leave the accommodations in your hands. In addition to downtown Charleston, there are options in nearby Mt. Pleasant, a short drive away. If you do stay there you’ll need transportation. The 2017 Lowcountry Pie Getaway includes a great package of instruction and extras – see below – but neither transportation or accommodations are included. If you’re flying, you’ll want to land at Charleston International Airport, about a 20 minute ride to downtown. If you’re not renting a car, just take a cab. If you’re staying downtown and don’t plan any excursions outside of Charleston, you probably don’t need to rent a car. Charleston is one of the best walking towns in the country, but bring comfortable walking shoes because you’ll be on your feet a lot and there are many uneven cobblestone streets to cross. Toni shows off her gorgeous cut-out top crust at last year’s Getaway. 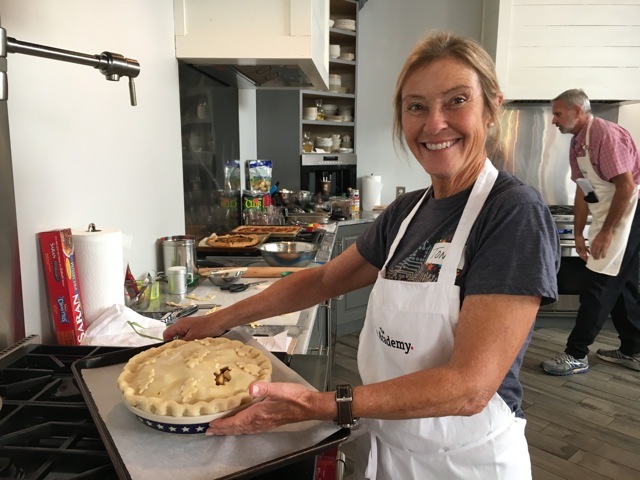 -Special Welcome Reception at our host kitchen, where you’ll meet your fellow pie bakers and receive your Lowcountry Pie Getaway Swag Bag, full of great surprise gifts. Apps and beverages will be served. 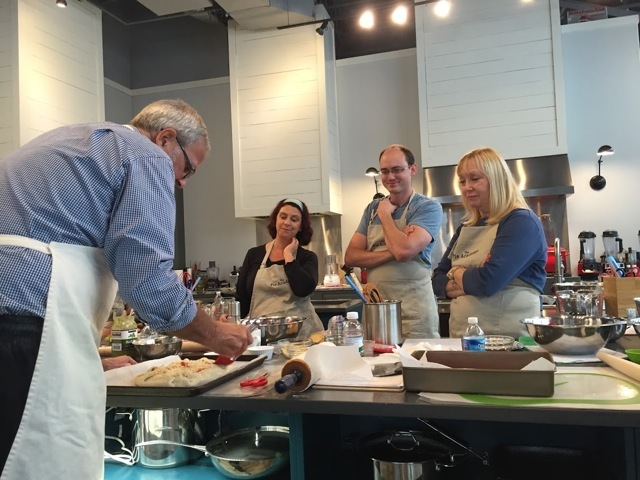 -Two hands-on, fun-filled, instruction-packed days of pie making with your host, Ken Haedrich, Dean of The Pie Academy and Julia Child Cookbook Award Winner. -All of your ingredients for a weekend of pie making. -Continental-style breakfast on Saturday and Sunday, served at our host facility. -Saturday and Sunday lunch featuring recipes from several of Ken’s cookbooks. -Special Sunday Send-Off Dinner prepared by our guest chef (to be announced) followed by our Pie & Ice Cream Social. 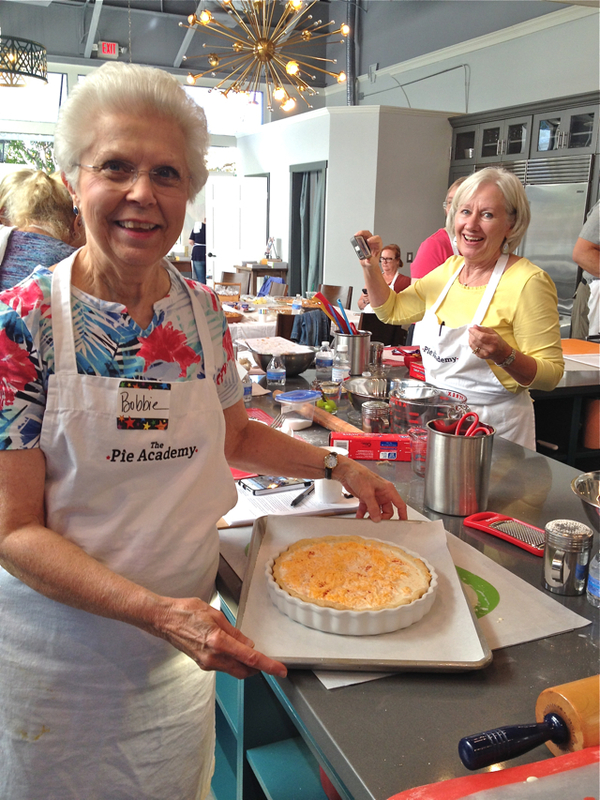 Send an email to my wife Bev – bev@thepieacademy.com – and request a Lowcountry Pie Getaway registration form. Fill it out and email or mail it back to us. After you return your completed registration form we will email you a PayPal invoice. You may also pay by check. You’ll find the details on the registration form. If you have any questions at all, about either the event or the registration process, please let us know. Be sure to include your phone number so we can contact you by phone, if necessary. Like all of our Pie Getaways, last year’s event in Charleston was a huge success, thanks in no small measure to the wonderful host venue and city. We expect no less of this Getaway. But please note: last year’s Pie Getaway filled up very quickly, even quicker than we anticipated. As large as our Charleston kitchen is, when all spots are filled we will promptly close registration. Limiting attendance is the only way we can insure that the instruction is personal and the experience is intimate for all. So let us know as soon as possible if you’re planning to come. Thanks again, and we hope to see you in October.